Here's a rough video I shot - soon I'll have access to a real camera, haha. Stand in one spot, holding blasters parallel to the ground at eye level (or at least as close as possible). Fire the Retaliator first, as the control blaster. Given that Elite blasters have been around for a while, most of us already know how well/far they'll shoot. After firing the Retaliator, place the camera at the mean range. Keep in mind that there is a couple feet of dart skip, since I am on pavement. 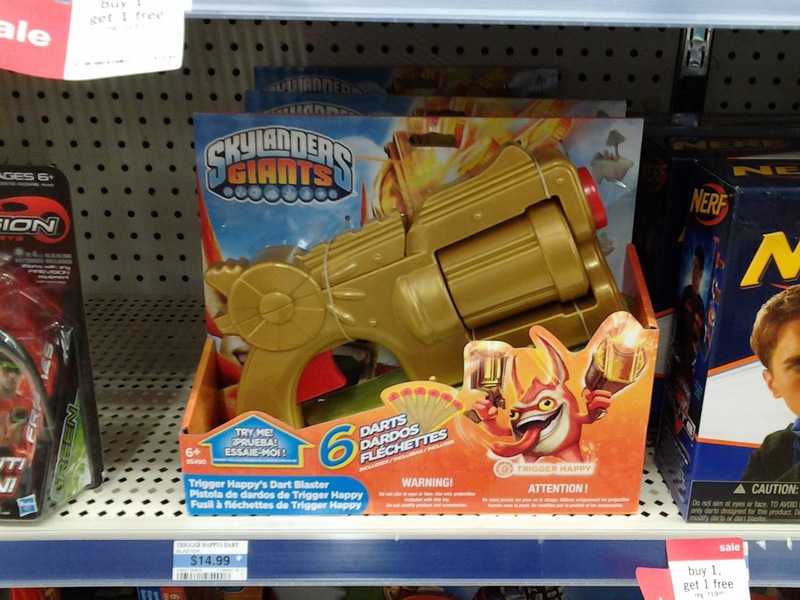 As you can see, the Skylanders pistol actually shoots on par with the Retaliator. The Tek 5...is quirky, to say the least. The barrels are about 1/8" too short for Elite darts, and the giant dart pegs are too tight on many darts, even some older Buzz Bee darts that I randomly grabbed for testing. After I drilled out the dart pegs (opening the air inlets in the turret to 1/4"), the Tek 5 shot much harder, but still a bit short. I blame this on the turret design - the air bleed slits in the turret are exposed almost immediately on firing, hampering the available power. Rebarreling will help this a lot. I spotted one of these at a Dollar General on the way home from class Friday, and grabbed it. 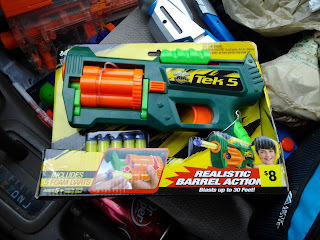 The NIC has known this blaster existed, but actual samples have been scarce, at least here in Ohio. So I'll shell out the $8 to buy it and go over it for you guys (and girls). If you're thinking it looks like a Maverick ripoff...you're halfway right. It functions the same, for certain, and it has the barrel weaknesses typical with Buzz Bee turrets. But the internals are decent. Read on for more! Well, this is an interesting development. With Skylanders becoming pretty big in gaming (essentially the most effective use of DLC I've ever seen without needing to download anything. Just send the kid's parents to the toy store! ), roleplaying toys were bound to appear. Among them is the blaster used in-game by Trigger Happy. Turns out Mega Bloks' parent company has a license to make Skylanders toys, and have ventured into foam blasters. At $15, it was a relatively cheap buy for being a licensed toy and a new item in general for reviewing. So I grabbed one and had fun. More after the jump! 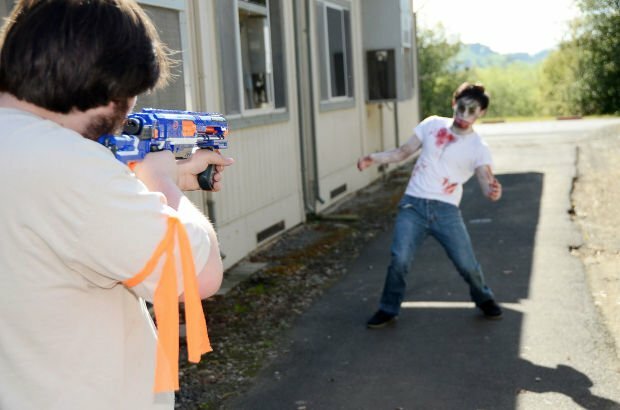 I understand the concerns, but seriously, virtually all HvZ games require stock or stock-looking blasters so there's no mistake that we're using toys. People see what they want to see, it seems.